Volvox, an indie puzzle game developed by the small Italian team Neotenia, was one of the bold (or unfortunate) few to have a release in the weeks directly preceding a Steam Winter sale, which seem every bit as capable of eclipsing new Steam releases as they were prior to the sales’ recent regrettable-but-understandable format changes. Volvox‘s store page boasts 250 levels in its campaign (and accordingly 60 hours of entertainment), which had me both intrigued and wary. A promise of that much content makes me wonder if the quality keeps up throughout, and whether it strays at times into repetition. As you can probably tell from the title of the article, my concerns were laid to rest; let me tell you how and why. 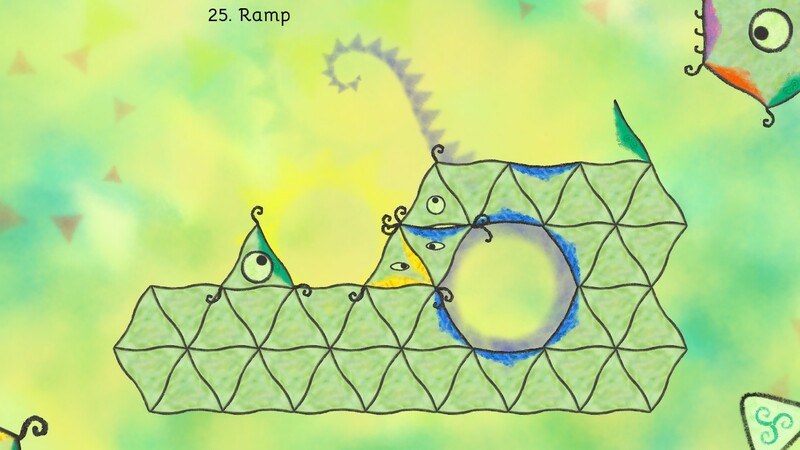 One of my early mistaken impressions about Volvox (after it made a somewhat poor first impression on me, detailed further below) was that it might be making use of one of my puzzle design pet peeves: levels that seem to have been designed by putting a solution on the screen, then shuffling the elements around the stage. You could call this the Rubik’s Cube approach to puzzle design. Some of the early levels, possibly because they are basic and tutorialized, are in that style and had me ready for more Rubik’s Cubery. So imagine my delight when the levels that followed proved me wrong again and again and again through dozens upon dozens of levels, all carefully designed and original (even when revisiting earlier level concepts). Neotenia’s lead designer, Sumero Lira, has successfully squeezed every conceivable puzzle task out of each and every one of the mechanics introduced in Volvox, including every challenge I could imagine and many I never would have expected. 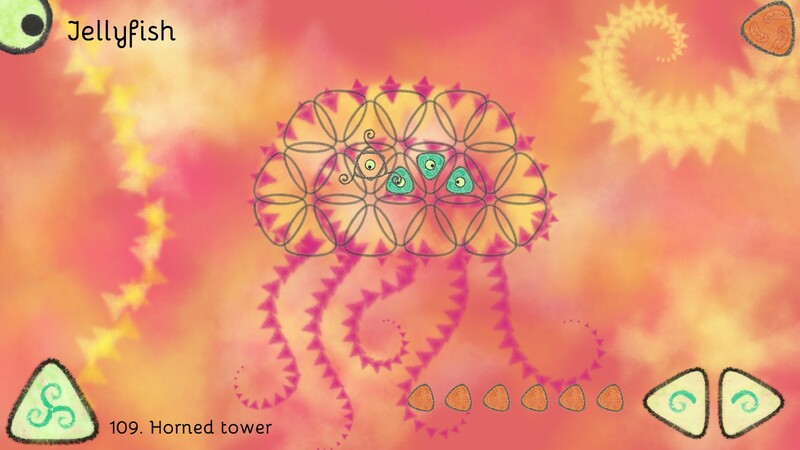 Volvox is a puzzle game for puzzle game fans. It doesn’t dress to impress; it just gives you one good, challenging puzzle to solve at a time. 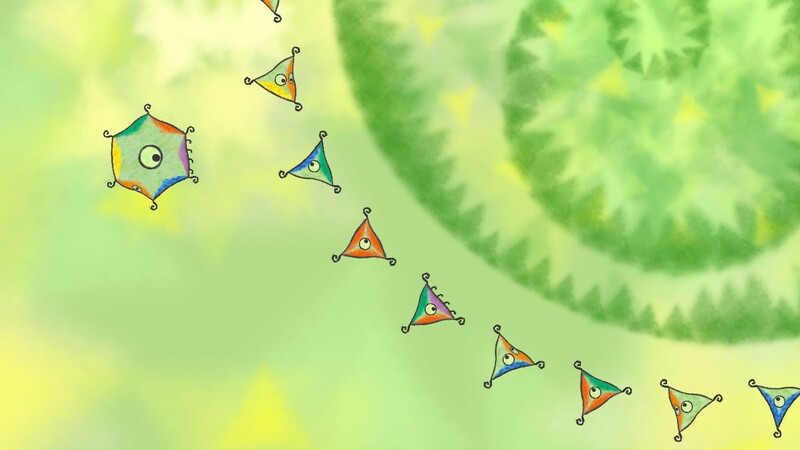 Volvox‘s deceptively simple core mechanics (rotating and reorienting triangles by moving them around the levels and around each other) open the door for mind-bending levels that often function like brain teasers. In fact, mastering the uniqueness of Volvox‘s movement style is the best way to start seeing solutions in levels that have you stuck. While it takes some getting used to, controlling the triangular game pieces (organic creatures called ‘Trimoebas’) soon becomes smooth and intuitive, and there were occasions on crowded levels when I felt that I was commanding a hive that thought as one. This sense is heightened by the animated eyes of the Trimoebas, which follow the mouse pointer’s every move. Admittedly, the gameplay is not completely perfect; it’s difficult to predict—without trial and error—how a Trimoeba will be oriented after a freefall, and the player will also initially have a tough time determining which way a Trimoeba will settle after balancing on a corner (there seems to be a rotation priority that comes into play in such cases). But the fact that both of these details, however unclear to initially figure out, do behave with total consistency means that they do not become more than minor issues while working out any given solution. My most desired feature is an ‘undo last move’ button; a misclick while controlling a glue-bearing Trimoeba means having to click quick-restart and reposition the solution. Having such a button would be a great convenient luxury, but I can also understand not wanting players to solve the early levels through trial and error alone, leaving them to become frustrated at not having learned the mechanics before the tougher levels. The game also features a story, and it’s a bit of an odd one. The premise is that six Trimoebas have fused into a hexagonal semi-deity, who is now guiding the other Trimoebas in the construction of increasingly complex multicellular organisms, starting with a volvox and ending with a fish (with 9 creatures total, each housing about 28 levels). Indeed, I am reminded of a number of different level-based indie puzzle games by different aspects of Volvox. The feeling of its gameplay evokes Obulis. Its design and geometric mechanics call TetroBot and Co. to mind. Its mounting difficulty and organic setting remind me of Splice. And, in a potentially unfavorable comparison, the art of the Trimoebas and the levels are reminiscent of Crayon Physics Deluxe. Volvox‘s aesthetics might not measure up to the aesthetics of those others, but it’s an unimpeachably strong game where it counts: in its gameplay. Having fully completed 4 of the game’s 9 creatures in just over 15 hours, I’m on pace for finishing the campaign in less than two thirds of the 60 hours the devs promise; but I know that Volvox also provides an advanced mode that unlocks at completion, so their estimate may not be too far off. And for a title that costs $7.99, that’s good value. Similar to my conclusion regarding Tribute Games’ Wizorb, Volvox is a game that makes simple promises and delivers on them, which (in addition to satisfying gameplay) is all I ask. Volvox, having bad English translations, a strange UI, confusing settings options, and an abstract pseudo-biological story, is a game that did not make a good first impression on me. (Later edit: the English translations have been fixed; this has also helped the options somewhat.) In the end, though, it won me over completely with simple, calming art and music as well as consistent, high-quality puzzle design that stays original and largely without gimmicks through hundreds of levels. It might have done this game some good to go through another round or two of final polish on its few rougher details (and a title this new may go through such a round yet). But it’s clear that the time Neotenia spent on the game—having focused, as far as I can tell, on meticulous design and fine-tuning of loads of content—was well-spent. If you’re a fan of puzzle games, don’t let the wonderful, well-designed challenge of Volvox leave your mind without checking it out. 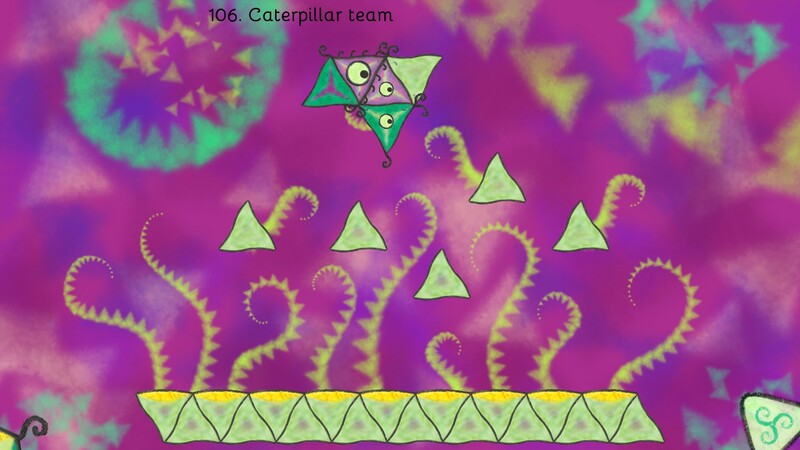 Tagged difficult game, indie game, Neotenia, PC game, puzzle game, video game review, Volvox. Enter your email address to subscribe to The Gemsbok and receive notifications of new posts! Daniel Podgorski is a participant in the Amazon Services LLC Associates Program, an affiliate advertising program designed to provide a means for sites to earn advertising fees by advertising and linking to amazon.com.